Gun Hill Signal Station, located in the parish of St.George, provides a magnificent view of the entire island. But what is it? It's a well preserved & restored "look out tower" from a series of signal stations built by the British. Gun Hill Station was built in 1818 and was one of six such lookouts stations installed in the 1800's. Back in the day these stations sighted ships approaching Barbados and signaled to each other in warning of the approaching vessel. They were also used to warn of slave rebellions on the island and fires in the sugar cane fields. But by the late 1800's, as better communication technology became available, these stations started to see less use. After the decline of the signal stations, the Gun Hill buildings fell into complete disrepair. The buildings meaning the station with its prominent tower, a kitchen, magazine, sentry box and ruined barracks. They sat this way for many years, vacant. 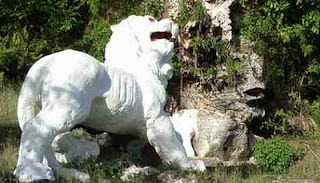 In 1868 a bored officer at Gun Hill carved the below lion out of a single piece of rock. I guess he had a lot of time on his hands. The signal station was leased then restored by the Barbados National Trust in 1981 with the help of a government grant. 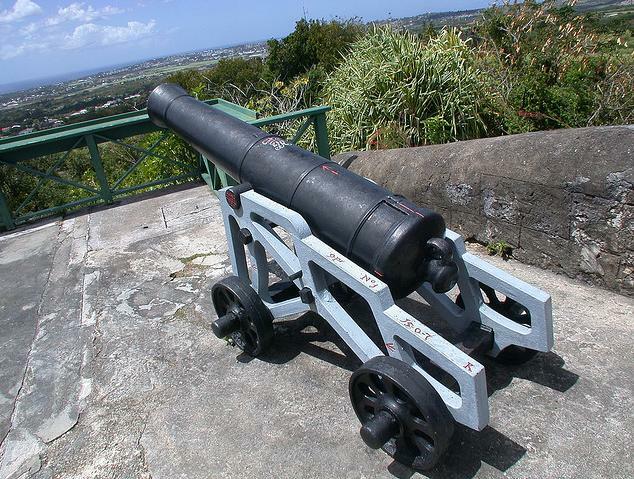 These days Gun Hill houses a collection of military memorabilia such as the wicked canon in the first photo. You can visit this historic landmark for a 360 degree tour of the island, and in fact, you can even get married on the hill! Check them out further at: Gun Hill Signal Station & Lion.